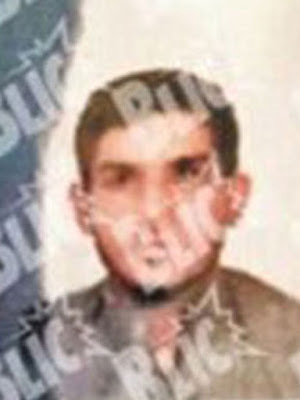 A terrorist behind the Paris attacks who allegedly posed as a Syrian refugee was rescued by Greek authorities after the migrant boat he had smuggled himself on sunk, it has been claimed. 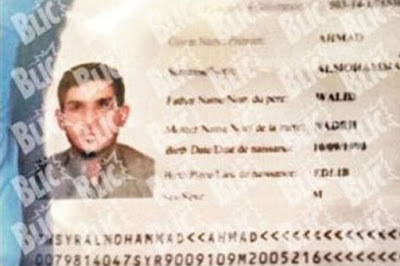 According to Serbian media, a Syrian passport belonging to Ahmed Almuhamed was found at the scene of the attack at the Stade de France. Now a Greek newspaper claims to have discovered the 25-year-old and a family member, called Mohammed Almuhmed, were rescued from a wrecked migrant boat that had sunk on the journey from Syria. The rescued men were brought to the island of Leros on October 3. They were among a convoy of 69 refugees who were registered and had their fingerprints taken before continuing on their journey. The newspaper Protothema says the men's passports were checked but the island authorities did not have the ability to determine whether their documents were real or not. Ferry tickets found by the newspaper allegedly showed he and his companion were transferred to Kalymnos to catch the ferry that would take them to the port of Piraeus in Athens. 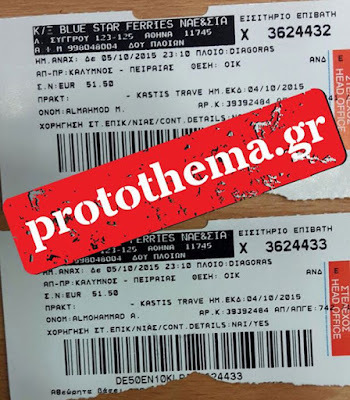 The tickets, from Kalymnos to Piraeus, were issued by Blue Star ferries and they travelled onboard the Diagoras. Greece’s deputy minister in charge of police, Nikos Toscas, said he was ‘identified [as a refugee] according to EU rules’ as he passed through the country. According to Serbian authorities, the men had arrived in the country by October 7. A statement from a minister said Almuhamed had requested asylum in the town of Presevo in Serbia before crossing into Croatia and Austria.